The image above by Visibuild, a host and solutions provider for the AEC industries, is running in realXtend, currently in early phase alpha, it is a platform to watch. The main attraction for us here at digital urban of realXtend is the ability to import models via Revit, ArchiCAD, SketchUp, 3DMax etc, something that Second Life still lacks in any quick and easy form. With a notable rendering quality, combined with the dynamic shade and shadows, realXtend creates an interesting and comparably low-cost way to experience an architectural design. 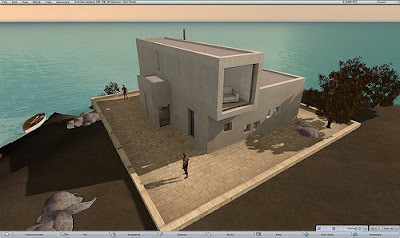 If you are at all interested in Virtual Architecture we recommend a trip over to The Arch Network, set up by Jon Brouchoud it focuses on the communication of architecture via Virtual Worlds. We will be taking a closer look at realXtend while our development using Unity is put on hold (our Mac was stolen). The Unity work will return as soon we get a replacement laptop sorted and our files restored via Time Machine. See The Arch Network for more details on SketchUp models running in realXtend. Second Life? Within a year or so from now you’ll probably have an optional active layer in Google Earth/Maps where you can put interactive objects including your own avatar. You may access this layer from your mobile in the real world as well, accessing people, features and stuff right on the spot. The technique is not that hard to accomplish.